May 4, 2016. Relevante Marketing has launched a new website for Catholic Community Foundation of Minnesota. CCF provides social, education and spiritual grants to non-profit organizations on behalf of its donors, and works to make philanthropy sustainable through sophisticated investing techniques. March 15, 2016. Relevante Marketing developed a customized Google AdWords training course for Jessica Scheff at Metro Pediatric Dental Associates in Saint Paul, MN. November 23, 2015. Relevante Marketing founder Craig Rentmeester has created a new online training course called SEO for WordPress. Available on Udemy.com, the training course is a comprehensive guide to learning how search engines work, on-site and off-site SEO best practices, and much more. August 18, 2015. Relevante Marketing has launched a new website for Cross-Tech Manufacturing’s Brush Wolf brand of products. Brush Wolf is a leading brand of brush cutting attachments for skid steers, excavators, backhoes, and compact utility loaders. July 31, 2015. Relevante Marketing has launched a new website for The Waters Senior Living along with a complete internet marketing system. The Waters has six senior living communities in Minnesota offering independent living, assisted living and specialty care. June 22, 2015. Relevante Marketing has launched a new website for Paradise Coast Hearing Care in Naples, FL. Paradise Coast Hearing Care is a provider of audiology services, including hearing tests, hearing aids, custom ear plugs and more for residents of Southwest Florida. June 11, 2015. Relevante Marketing successfully conducted on-site and off-site SEO training for NUU Mobile. NUU Mobile manufactures a line of unlocked Android smartphones for use with multiple carriers. June 9, 2015. Relevante Marketing has launched a new website for Kane Pension Design & Administration. Brian Kane will be providing actuarial consulting services for business owners planning their retirement plans. June 5, 2015. Relevante Marketing is proud to have two clients work featured in the Minneapolis-St. Paul Luxury Home Tour. Detail Homes partnered with Designed & Made Custom Woodworking to create the home located at 700 Osceola Ave in St. Paul which is featured in the tour. April 22, 2015. Relevante Marketing has launched an online advertising and media relations campaign today for Skid-Lift. Skid-Lift has created a patent pending scissor lift attachment for skid steers and tractors that allows people to safely work up to 20 feet in the air. March 17, 2015. Relevante Marketing has designed and developed a new website for Brian Grabski at Designed and Made Custom Woodworking. Brian is a true craftsman, and the new website features full width, high resolution photography to showcase his work. The new website offers ECommerce functionality, custom landing pages, and a beautiful WordPress backend for content management. February 9, 2015. Relevante Marketing designed and developed a new website for Visum, creators of FocalPoint Software for the rental industry. The new website is responsive, features a customer support portal, high resolution photography and many more features. December 3, 2015. Relevante Marketing delivered a custom WordPress training session for Better Futures Minnesota, a nonprofit program that helps individuals reinvent themselves after falling on hard times. May 21, 2014. Relevante Marketing founder Craig Rentmeester has co-founded Freak Plugins, a WordPress plugin company that creates powerful and easy to use plugins. SharePrints is Freak Plugins first available plugin. SharePrints is a responsive image gallery plugin for WordPress that allows site owners and businesses to easily create, manage and publish beautiful image galleries in 7 different layouts with just a few clicks. April 16, 2014. 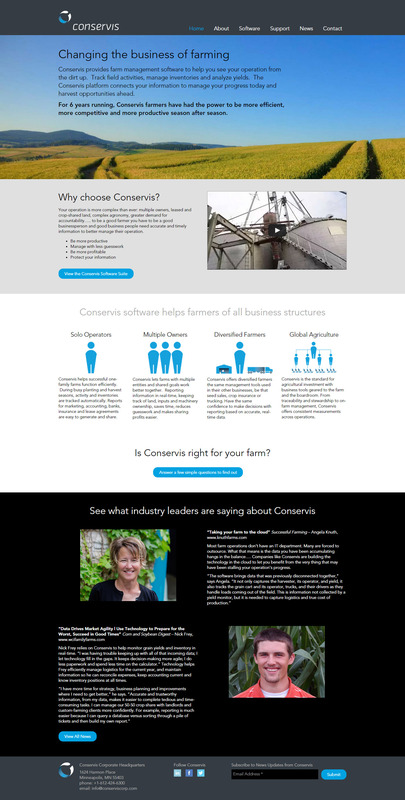 Relevante Marketing launched a custom WordPress website for Conservis, an agricultural software company located in Minneapolis, MN. Conservis provides crop farmers with a suite of software tools to help them track inventory, planting, and harvesting data through web-based software, and apps. March 21, 2014. Relevante Marketing launched a custom website for Caribou Coffee at Minneapolis-St. Paul Airport. The company operates 7 locations at Terminal 1 and 2 at MSP airport. The website is fully responsive, allowing travelers easy access to location information while they’re on the go. March 20, 2014. Relevante Marketing launched a custom website for Rock Solid Incentives, a custom incentive marketing company serving companies throughout North America. The website is developed for WordPress, is fully responsive, and allows visitors to preview Rock Solid Incentives’ proprietary rewards platform. February 22, 2014. Relevante Marketing Owner Craig Rentmeester spoke at the Gamma Beta Phi National Convention in Celebration, FL this past weekend. His speech, titled Personal Branding in a Social Media-Driven World, addressed current college students and university employees. The speech included a Social Media Overview, Reputation Management, The Benefits of Blogging, Social Media Best Practices, and Job Hunting Tips. January 29, 2014. Relevante Marketing launched a custom website for White Oaks Investment Management, an investment management firm in Sarasota, FL. January 27, 2014. Relevante Marketing created and delivered Advanced WordPress Training to local author P. Luther Wilson in Minneapolis, MN. The course covered many topics, including how install, configure, customize and manage a WordPress website. In addition, Relevante Marketing helped with domain transfer and website hosting. January 8, 2014. Relevante Marketing created and delivered a custom SEO and Google Analytics training session for Hilary Mays at Outdoor GreatRooms Company in Eagan, MN. The session will allow Hilary and Outdoor GreatRooms to save money on SEO, website maintenance, as well as tracking and reporting. November 14, 2013. Relevante Marketing successfully launched a new website for Detail Homes, a design and build firm with projects in Minneapolis and St. Paul. The new website features a modern and minimalist look, is built to be mobile-friendly and features powerful website editing tools within WordPress for the business owners to keep their portfolio up to date. October 13, 2014. Relevante Marketing has partnered with ImageWerks Marketing to provide SEO Consulting and Services for ImageWerks’ clients. Relevante Marketing is currently assisting with Vista Prairie Communities, a company which owns and operates assisted living, memory care and managed care facilities throughout the Upper Midwest. October 7, 2013. Relevante Marketing successfully launched a new website for White Oaks Wealth Advisors, a financial planning and wealth management firm with offices in Minnesota and Florida. White Oaks Wealth Advisors specializes in helping high net worth individuals and families protect, grow and transfer their wealth. The new website features a host of improvements for clients, and is mobile friendly, adapting to visitors screens across desktops, laptops, tablets and smartphones. October 7, 2013. Relevante Marketing successfully launched a new website for Matzke Chiropractic, a new chiropractic office located in De Pere, WI. Dr. Tom Matzke focuses on helping people get back to their lifestyle through chiropractic care, nutrition counseling and more. In addition, Dr. Matzke has successfully treated patients of all ages, including young children, adults and elderly individuals. September 9, 2013. Relevante Marketing successfully launched a new website for Affies4Kids. Affies4Kids provides character-building stories for parents and teachers to use to teach young children the language of positive self talk. The website features Family and Classroom subscriptions, E-Commerce, affiliate management and much more. September 3, 2013. Relevante Marketing successfully launched a new WordPress website for the Wisconsin Chapter of the Alexander Graham Bell Association, a nonprofit group that helps families affected by hearing loss. July 18, 2013. Relevante Marketing created and delivered a custom social media training for members of the online marketing department at Wells Fargo Shareowner Services. July 17, 2013. Relevante Marketing successfully launched a new website for Pioneer Machinery, a company in Woodland, CA that provides rentals and sales of industrial equipment. The new website showcases available equipment and links to a customer portal where customers can view and pay invoices. July 8, 2013. Relevante Marketing created and delivered custom internet marketing training for Silvars, which covered internet marketing strategy, WordPress training, AdWords training and social media training. June 13, 2013. Craig Rentmeester spoke today about social media at a monthly meeting for the Owatonna Chapter of the Society for Human Resource Management. The meeting was held at Owatonna Country Club. Learn more. June 12, 2013. Relevante Marketing successfully redesigned Infinity Access’s website. The new website, built on WordPress, features fall protection and fall arrest systems, photo galleries of past projects and more. Infinity Access provides estimating, design, installation, training, inspection and certification services to architects, engineers, contractors, construction tradespeople, building owners and property managers throughout the United States and Canada. Relevante Marketing provides custom internet marketing training to Sherrie Bartolotto. May 22, 2013. Relevante Marketing created and delivered custom social media, AdWords and SEO training to Sherrie Bartolotto of Vivo Solutions. March 19, 2013. Craig Rentmeester will be speaking at a monthly meeting for the Club Caterer’s Association at Wayzata Country Club on Wednesday March 20, 2013. The speech will focus on how Catering Mangers and Food & Beverage Managers can leverage social media to increase food and beverage sales at local country clubs. March 14, 2013. Relevante Marketing conducted three custom social media and analytics training sessions with Shelly Howard, a seasoned marketing and advertising professional. Learn more about Shelly on LinkedIn. March 5, 2013. Relevante Marketing successfully redesigned and developed a new website for Holubar Construction Company. The new website features an interactive portfolio of past railroad construction and rehab projects, responsive design for mobile devices and much more. Holubar Construction Company is a railroad contractor that has been designing, building and maintaining railroads in the Midwest and beyond since 1979. February 7, 2013. Relevante Marketing conducted custom WordPress training with Daniel Pederson and Doug Abbott of Hennepin Avenue United Methodist Church. February 5, 2013. Relevante Marketing successfully designed and developed a new website for Tempo Investment Advisors. The new website, built on WordPress, features a real-time stock market ticker, biographies, MailChimp integrations and much more. Tempo Investment Advisors is a boutique investment management firm with offices in Chaska, MN and Midland, MI, serving clients throughout the United States. January 9, 2013. Relevante Marketing successfully redesigned Infinity Scaffold’s website. The new website, built on WordPress, features impressive scaffolding projects, photo galleries and more. Infinity Scaffold is a leading scaffold company providing scaffold rentals, design, delivery, and installation services throughout Minnesota and the Upper Midwest.